that reflect the creativity of the maker. Hohepa Creative Works came about to enable us to enhance the services that we are offering and to meet the demand for our Day Services. This got us thinking about creating a new space to help with this and sent us on a journey to discover all the other benefits that would come with this. Having our Creative Works in town means that service users are able to come to work by bus or by foot. It has also enabled us to connect ourselves with the local community on a daily basis. 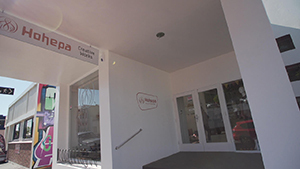 What is Hohepa Creative Works? Hohepa Creative Works is a space where we create our weavery and candle products for sale in the on-site store, online and in many retails throughout NZ. We welcome people from the community to come in and see our work and take a tour around the space to see how these pieces come to life. It is also a space where we will run workshops, invite people in to run workshops, share and create new ideas and come together as a community in an open and safe environment.